The TRS40 Series is a custom-design aeration system for medium to large tanks with high turnover. The system integrates energy-efficient spray aeration, powerful impeller mixing and active ventilation to maximize THM removal while minimizing cost. 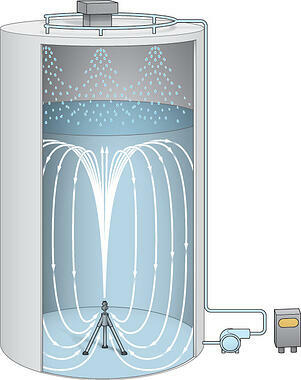 The TRS is a custom-designed aeration system to reduce THMs in storage tanks. Using a portfolio of technologies – sprayers, surface aerators, tank mixers – and our proprietary NEPTUNE Toolbox™ modeling software, TRS is cost and energy optimized for THM removal.